Well Happy New Year everybody! Last week millions of people counted down the final hours, minutes and seconds of 2013 to ring in the much-anticipated 2014. A new year marks a fresh start, accompanied by a host of new resolutions. But to a number of us Southerners, the turn of the New Year is hardly the climax. It’s more of a stepping stone. It may be hard for you to believe, but the celebration to welcome in the new year hasn’t always been on New Year’s Eve. 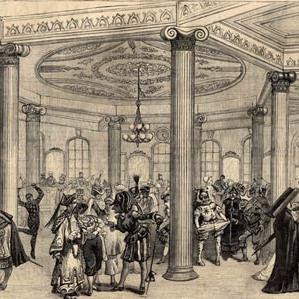 Rather, the more fashionable time to celebrate was six days later on January 6, which marks the twelfth and final night of Christmas, the Feast of the Epiphany, and the start of the Mardi Gras season. Now before you visualize our forefathers trumpeting sparkly noise-makers and popping bottles of champagne, allow me to set the record straight. January 6 has historically been a day of revelry, as well as a popular time for the young and elite to marry or become engaged. President George Washington held his wedding on this day in 1759, as did his granddaughter 36 years later. At the time, the newly acquired state of Louisiana also looked forward to the 6th of January, marking the introduction of all the young debutantes into society. Even now, the exclusive Twelfth Night Ball is held on the evening of Epiphany as the premier event for young debutantes. What’s the matter? Have your young debutante days passed you by? The good news is, that from these historical January 6 festivities, many other customs have evolved that aren’t quite as limiting. Take Mardi Gras for example, which brings about cause for another January 6th celebration: King’s Day. 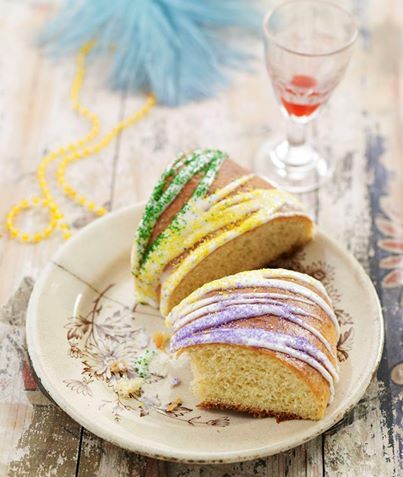 You may be familiar with a King Cake, which honors the three kings at the onset of Mardi Gras. The first King Cakes were simple rings of dough, yet they’ve evolved into beautiful and festive masterpieces—tri-colored in purple, green and gold (symbolizing justice, faith and power). Within every cake, a tiny plastic baby is placed (although the baby was at one time porcelain, and even gold). The recipient of the small prize is named “Mardi Gras King” among friends and family and often hosts the next King Cake party at their home. New Orleans-native chefs are spread far and wide throughout the Southeast, which proves particularly convenient for all of us come Mardi Gras season. Chefs like David Guas of Bayou Bakery, Coffee Bar & Eatery (Arlington, VA), Cory Bahr of Restaurant Cotton (Monroe, LA) and restaurateur Ralph Brennan of the Ralph Brennan Restaurant Group (New Orleans, LA) gear up with the finest King Cakes to celebrate the end of another holiday season and the start of a fresh new year. Because that’s what it’s all about, and you certainly don’t need blue blood to celebrate! So as you can see, people, January 6 is right around the corner, and you haven’t much time left. 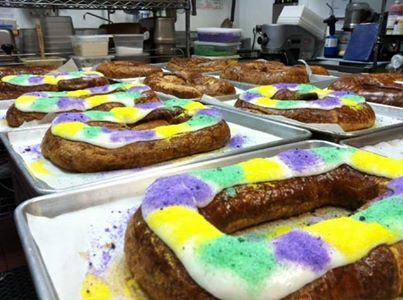 If you were planning on making your King Cake from scratch, I fear you’re already too late. Good news is, there’s a little ‘New Orleans’ in every city, and whoever they are, they’re selling these babies like hot cakes (all puns intended). So go out and get you one to ring in the New Year with friends and family. Who’s ready for New Year’s Round Two!? I’m Simone. And this is what simone sez. King Cakes in preparation at Bayou Bakery. Have you ordered yours yet? This entry was posted on January 6, 2014 by Simone in Uncategorized.